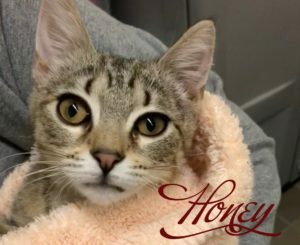 Honey, who was born on 9/18/18, was named for her honey-colored tabby coat, and her sweet nature. She was looking for warmth and safety in all the wrong places…Honey was found in the engine of a car at a car wash in Elmont! Honey is now looking for a warm and loving forever home. Come meet this adorable girl and make your home hers! This entry was posted in Adopted Cats, Cats, Female, Under 6 Months, Wantagh Adoption Center. Bookmark the permalink.